I am a member of the UK street team for etsy and the members have been working hard to give the blog a fresh new look. I have just writen an article about summery things to buy on etsy, just click here to read it. My favourite item is by the very talented Cherrypips, she makes the most beautiful brooches and this mimosa one is just one of many I could have picked. that is a beautiful brooch. Ciao dall'Italia. 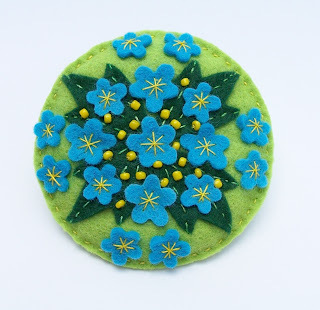 Many compliments for your felt flowers!